We each have equal worth. I don’t make any money from my work. But you can contribute by making a donation and help me continue to research and write informative, insightful and independent articles, and to provide support to others. The smallest amount is much appreciated – thank you. © 2012 - present by Kitty Sue Jones. All original material created for this site is © Kitty S Jones. Posts may be shared, provided full credit is given to Kitty S Jones and Politics And Insights, along with a link back to this site. Sharing articles using the site Reblog or Press This button is welcomed. Using any of my writing for a commercial purpose is not allowed without my express permission. Excerpts and links, including paraphrasing, may be used, provided that full and clear credit is given to Kitty S Jones and Politics And Insights with appropriate and specific direction to the original content. Unless otherwise credited, all content is the site author's. The right of Kitty S Jones to be identified as the author of this work has been asserted by her in accordance with the Copyright, Designs and Patents Act 1988. Osborne’s targeted austerity measures, based entirely on Conservative small state ideology, rather than economic necessity, have established an economic trap. It’s a vicious cycle, because tax cuts to the wealthy, and low, stagnated wages reduce Treasury income, thus increasing the deficit – which is the gap between Treasury income and what is needed for spending. His solution? Cut spending and public services. Again and again. Yet this is clearly not working. Reducing spending means shrinking the economy further. The services that the state provides – education, healthcare, social security, housing, for example – also contribute to our wellbeing and raise our standard of living. Of course reducing consumer spending also serves to deflate the economy further. Meanwhile our overall debt has increased. It’s a strategy doomed to failure all round, and it certainly exposes the lie that the financial burden of paying the deficit is shared and that “those with the broadest shoulders” carry the largest burden. Those experiencing the worst of the cuts are the poorest. I’m not sure if the Conservatives have massively understated the damage that spending cuts inflict on a weak economy because they don’t understand that this is the case or because they don’t actually care. But you would think that the evidence after five years would have prompted a rethink, if it were the former case. 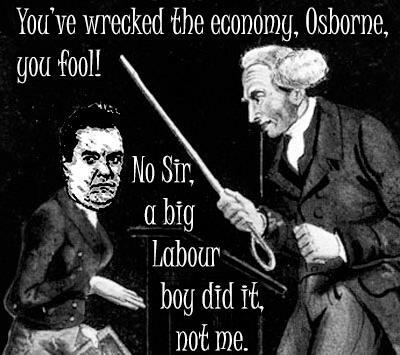 The initial economic research that was held up to support austerity measures has since been thoroughly discredited. Widely touted statistical results were, it turned out, based on highly dubious assumptions and procedures and a few outright mathematical errors – it didn’t stand up to scrutiny. You really can’t cut your way out of a shrinking economy. Austerity and spending cuts are actually intrinsic to New Right and neoliberal ideology. Margaret Thatcher radically cut public spending, created recession and generally messed up, but Cameron’s government have gone much further than she dared. Conservatives have manipulated the general public’s lack of understanding about basic economics, and lied about the “dangers” of debt and deficits in order to radically reduce the welfare state and justify cuts to people’s lifeline benefits, cuts to public services such as the national health service, social care, legal aid, and to councils, for example. The Tories have also set about reversing all of the social gains of our post-war settlement, in fact. It’s something they have always hated. 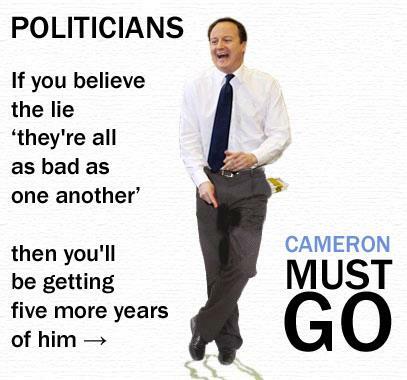 They have persistently denied that higher spending might actually be beneficial to the majority of UK citizens. Austerity has been paraded as the only possibility, as “economically necessary” but that’s utter tosh. Gordon Brown said today that when the worst of the global recession hit, his government protected the most vulnerable social groups – including children. He’s right, we didn’t need austerity back then, in the throes of the global crisis. Brown put in place a package of expansionary fiscal measures, and we were in recovery by the last quarter of 2009. The Conservatives put us straight back into recession and lost our Fitch and Moody international credit ratings to boot. Something that George Osborne pledged he would maintain as a priority, back in 2010. And the national debt is growing, not shrinking. Economic competence is measured by our social conditions and the living standards of citizens far more than by dry numbers and the ideological commitments of government. Austerity is failing millions, who have witnessed the biggest fall in living standards since before the war. And if a political strategy is failing and damaging people’s lives, as austerity clearly is, then it’s time to change that strategy. A timely reminder of the warnings about Osborne’s cuts from the spending review last autumn. Conservative MP for Stevenage, Stephen McPartland, has conscientiously boycotted a meeting with a treasury minister David Gaulke, after he discovered that tax credits will be cut, despite assurances to the contrary from the Government. McPartland did some research, he asked the House of Commons Library for statistical information and found that it calls into question the prime minister’s promise that child tax credits were “not going to fall”. McPartland, who is one of the two Conservatives that voted against tax credit cuts in September, says that information from the Commons Library reveals that 830,000 families would see their child tax credit support cut in 2015/16 because of measures proposed in the summer budget. He told the Telegraph: “I am boycotting the meeting and the media are not invited, as he [Mr Gauke] does not want to talk about the cuts to child tax credits I have uncovered. Gordon Brown – who was the designer of tax credits when he was Chancellor – spoke at a meeting with the Child Poverty Action Group in central London today. He said that the tax-credit cuts are “totally counter to British Values” and warned child poverty would hit a 50-year high if the reforms are not abandoned in full. He concluded that the tax credits cuts “anti-work, anti-family, anti-children, anti-fairness, anti-women, and in my opinion anti-British”. This post was written for Welfare Weekly, which is a socially responsible and ethical news provider, specialising in social welfare related news and opinion. I wrote an article last year – Follow the Money: Tory Ideology is all about handouts to the wealthy that are funded by the poor – which outlines Coalition policies that have widened inequalities and increased poverty by handing out public money to the wealthy that has been taken from the poorest. I pointed out that this Government have raided our tax-funded welfare provision and used it to provide handouts to the very wealthy – £107,000 EACH PER YEAR in the form of a tax break for millionaires, amongst other things. And what does our imperturbable chancellor promise if this disgrace of a government is re-elected? True to Tory form, more of the same: austerity for the poor and public services cuts, and tax breaks for the wealthiest. But further cuts to lifeline benefits and public services is surely untenable. Absolute poverty has risen dramatically, this past four years, heralding the return of Victorian illnesses that are associated with malnutrition. People have died as a consequence of the welfare “reforms”. Supporting the wealthy has already cost the poorest so very much, yet this callous, indifferent, morally nihilistic government are casually discussing taking even more from those with the very least. This isn’t anything to do with economic necessity: it’s all about Tory ideology. Under the guise of austerity, the Tory-led Coalition have stripped our welfare and public services down to the bare bones. Any further cuts will destroy what remains of our post-war settlement. Despite facing a global recession, the Labour Government invested in our public services, and borrowed substantially less in thirteen years than the Coalition have in just three years. UK citizens were sheltered very well from the worst of the global bank-induced crash. Gordon Brown got it right in his championing of the G20 fiscal stimulus, agreed at the London summit of early April 2010, which was a continuation of his policies that had served to steer the UK economy out of the consequences of a global recession, and to protect citizens from the consequences of cuts to services and welfare. Osborne’s policy of imposing austerity and budget cuts on an economy that was actually recovering was a catastrophic error. The austerity propelled the economy backwards and into depression; and, far from using public spending as a countervailing force against the cutbacks in private sector investment, the Coalition’s budget cuts served to aggravate the crisis. Many people are suffering terribly as a consequence, reduced to a struggle for survival. And in these socio-economic circumstances, the Tories have pledged a further £7.2 BILLION tax cuts to the rich. The funding for the tax cuts will come from further catastrophic “savings” made at the expense of the poorest yet again – £25 billion more to be sliced from welfare, Local Authorities, education, police and other vital services. Three things are immediately clear. 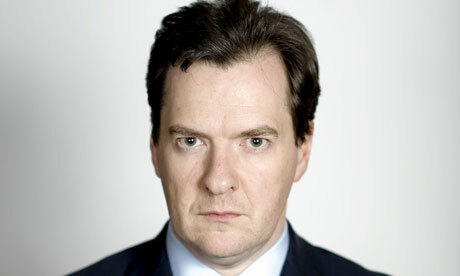 Firstly, without the ramping up of VAT in 2010, to 20%, Osborne would be in even more dire financial straits than he is. Secondly, income tax has, despite allegedly rising employment, failed to increase. Thirdly, corporation tax, targeted for cuts, year after year, has slumped. 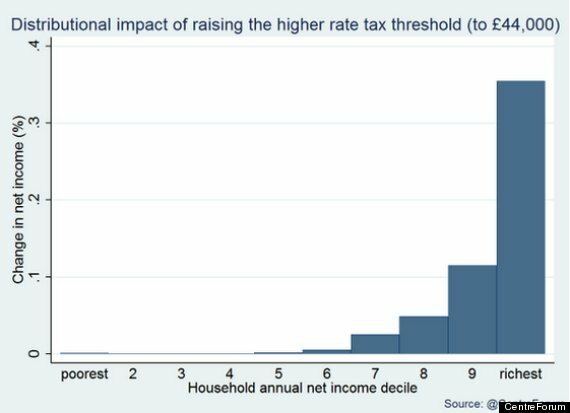 The tax system is increasingly veering toward very regressive – biased in favour of the wealthy – consumption taxes, which affects the poorest, most, and failing to deliver fairer taxes on income. This is the result of government policy: increasing VAT but cutting corporation tax, and the engineered kind of “recovery” we have ended up with. The Office for Budgetary Responsibility (OBR) reminded us in October of the extent of the Coalition’s failure to reduce the deficit. Public sector net borrowing in 2013-14 was originally expected to be £60 billion; the out-turn for borrowing was £108 billion (on a comparable basis). This amounts to a shortfall of nearly £50 billion, with borrowing approaching double the original predictions made when the government’s austerity policies were announced in 2010. Much of this shortfall is accounted for by the current earnings crisis. UK workers are suffering the longest and most severe decline in real earnings since records began in Victorian times, according to an analysis published by the TUC. 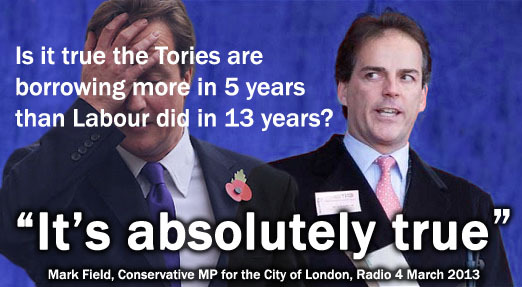 But Tories always lower wages, and hike up the cost of living. And whilst workers are struggling to make ends meet, private business owners/Tory donors are raking in millions of pounds. But this is exactly how Tories like to run society in a nutshell. It’s their imposition of a feudalist schemata for social relationships. Cognitively, Tories are the equivalent of historical egocentric toddlers: they are stuck at this painful stage of arrested development. “The deficit reduction programme takes precedence over any of the other measures in this agreement” – stated in the Coalition Agreement. For a government whose raison d’etre is deficit reduction, the Coalition really isn’t very good at all. But austerity reflects the triumph of discriminatory Tory ideology over needs-led, evidenced-based policy making. The OBR said the forecast from 2010 was over-optimistic because it did not take into consideration the effect of lower wages as well as a higher levels of tax-free personal allowance on the upper brackets of income tax. National Insurance contributions were also £7.4 billion below forecast. Which brings us back to the issue of further tax cuts for the wealthy, with no mention of raising wages for the poorer work-force, and of course there is the promise of more cuts to come for those relying on lifeline benefits. I don’t think that the Coalition cares that their policies don’t balance the books, as it were, or mend the economy. Nor do they care what the consequences are for the wider public. The government’s failure to get wages growing again has not only left families far worse off than in 2010, it’s put the public finances in a mess too. The economy has become very good at creating low-paid jobs, but not the better paid work that brings in income tax. The Chancellor’s sums just don’t add up – he can’t make the tax cuts for the better off that he is promising and meet his deficit reduction target without making cuts to public services. His cuts would be so deep that no government could deliver them without doing damage to both the economy and the fabric of our society. We can’t cut our way out of this problem any more than we can dig ourselves out of a hole. 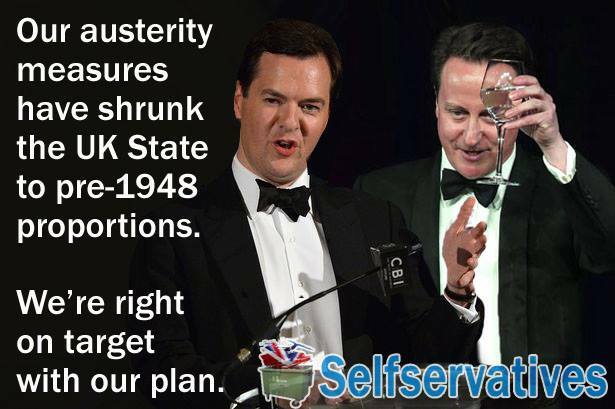 More austerity would only keep us stuck in a downward spiral. The Chancellor should use next week’s Autumn Statement to invest in growth and to put a wages recovery at the top of the agenda. Nobody will be fooled by pie in the sky promises of tax cuts when David Cameron cannot tell us where the money is coming from. Even the Tories admit this is an unfunded commitment of over £7 billion, so how will they pay for it? Will they raise VAT on families and pensioners again? Cameron has also announced the basic rate before we start paying tax would rise from £10,500 to £12,500. 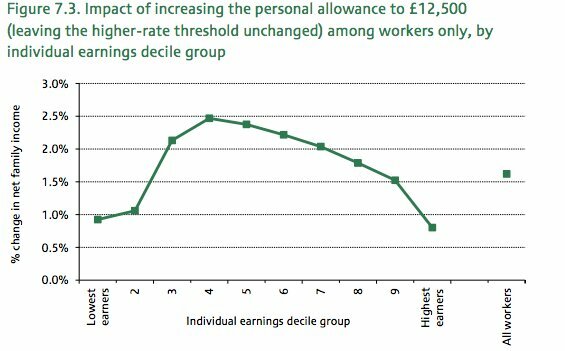 While a worker on £12,500 would save £500 a year, someone earning £50,000 would keep £1,900 extra. Those earning up to £123,000 would be £484 richer. Someone on £12,500 would save £500 a year, while someone on up to £50,000 would keep £1,900 extra. And the £500 tax cut for basic rate earners will be almost wiped out by George Osborne’s raid on in-work benefits. very difficult to see how the £7billion tax giveaway could be paid for. We’re looking at promises of £7billion of tax giveaways in the context of an overall plan to get the deficit down but even without tax giveaways that requires pretty extraordinary levels of spending cuts such that most government departments will see their spending cut by a third by 2020. How are you going to afford this? Even more dramatic spending cuts? At the Tory Conference, Cameron promised to expand the National Citizen Service youth project for every teenager in the country, have the lowest rate of corporation tax of any major economy. There was also a pledge to abolish youth unemployment by the end of the decade. But the Tory faithful gave the loudest applause for his pledge to scrap the Human Rights Act. This is a truly terrifying pledge, because human rights were originally formulated as an international response to the atrocities of the 2nd World war, and to ensure that citizens are protected from abuses of their government. A Labour Party analysis found the proposed tax break would hand David Cameron and other Cabinet ministers an extra £132 a year. 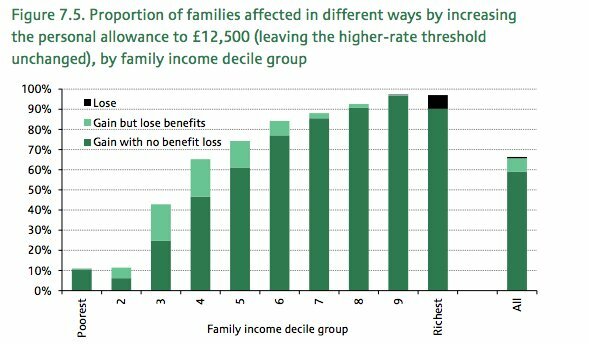 But a family with two children with one earner on £25,000 a year would lose £495 by 2017-17 due to the benefits freeze announced by Mr Osborne. The Tory plan is based solely on spending cuts, mainly directed at the working age poor. And the Conservative plan to raise the higher rate threshold to £50,000 means that working-age poor people are to fund a tax cut that is four times greater for higher rate tax payers than for basic rate taxpayers. David Cameron’s speech showed no recognition that working people are £1,600 a year worse off under the Tories nor that the NHS is going backwards on their watch. The only concrete pledge we’ve had from the Tories this week is a promise to cut tax credits by hundreds of pounds for millions of hard working people while keeping a £3 billion tax cut for the richest one per cent. No amount of dressing up can hide the fact that the policies in this speech pass by those who need the most help to reward richer voters. What was missing in the PM’s speech was any recognition that independent projections show that child poverty rates are set to soar. We know that raising the personal tax allowance is an ineffective way of supporting low paid families.Independent analysis shows that just 15% of the £12 billion required to raise the PTA to £12,500 would go to working families in the lowest-income half of the population. Many simply don’t earn enough to benefit from this policy, and those that do just see their benefits and tax credits withdrawn as their incomes rise. There are better ways to help the low paid via the tax and benefit system. irresponsible, expensive gimmicks that scarcely affect the poorest workers. 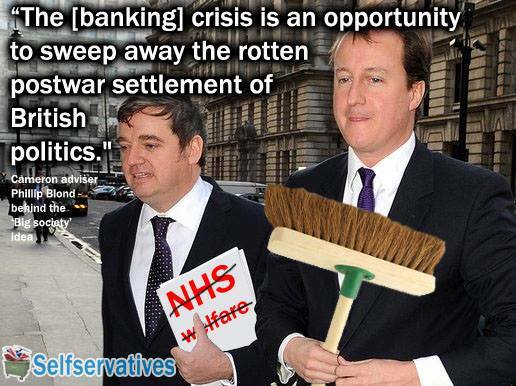 They imply swingeing public sector cuts and mean handing over more cash to the already rich. Ed Miliband will respond tomorrow (Monday), declaring that the Tories’ failure to tackle the cost-of-living crisis has helped cost the Exchequer £116.5 billion – leading to higher borrowing and broken promises on the deficit. The price tag, equivalent to almost £4,000 for every taxpayer, is based on new research from the House of Commons Library being published by the Labour Party. Income tax receipts have fallen short of forecasts by more than £66 billion. National Insurance Contributions are £25.5 billion lower than expected. Mr Miliband is expected to say the test for George Osborne in this week’s Autumn Statement will be to set out a plan to build a recovery for working people – one which recognises the link between the living standards and Britain’s ability get the deficit down. For a very long time, our country has worked well for a few people, but not for everyday people. “We live in a country where opportunities are too skewed to those at the top, where too many people work hard for little reward, where too many young people can’t find a job or apprenticeship worthy of their talents, and where families can’t afford to buy a home of their own. For all the Government’s boasts about a belated economic recovery, there are millions of families still caught in the most prolonged cost-of-living crisis for a century. For them this is a joy-less and pay-less recovery. My priority as Prime Minister will be tackling that cost-of-living crisis so that hard work is properly rewarded again, so that our children can dream of a better future, so that our public services including the NHS are safe. Building a recovery that works for everyday people is the real test of the Autumn Statement. But that isn’t a different priority to tackling the deficit. Building a recovery that works for most people is an essential part of balancing the books. The Government’s failure to build a recovery that works for every-day people and tackle the cost-of-living crisis isn’t just bad for every person affected, it also hampers our ability to pay down the deficit. Britain’s public finances have been weakened by a Tory-led Government overseeing stagnant wages which keep tax revenues low. Britain’s public finances have been weakened by Tory policies which focus on low paid, low skilled, insecure jobs – often part-time or temporary – because they do not raise as much revenue as the high skill, high wage opportunities we need to be creating. And our public finances have been weakened by higher social security bills to subsidise low paid jobs and the chronic shortage of homes. The result has been David Cameron and George Osborne missing every single target they set themselves on clearing the deficit and balancing the books by the end of this parliament. Their broken promises, their abject failure, are not an accident. They are the direct result of an outdated ideology which says all a Government has to do is look after a privileged few at the top and everyone else will follow. 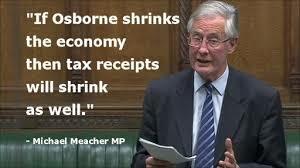 That is why this Government has done a great job of squeezing the middle, but a bad job of squeezing the deficit. The test this week for David Cameron and George Osborne is whether they recognise that Britain will only succeed and prosper for the long term by tackling the cost-of-living crisis and building a recovery which works for the many, not just for a few. Or whether they will just offer more of the same old ideas that have failed them, failed everyday working people, and failed Britain over the past four years. 1. Longest period of sustained low inflation since the 60s. 3. Introduced the National Minimum Wage and raised it to £5.52 per hour. 4. Over 14,000 more police in England and Wales. 5. Cut overall crime by 32 per cent. 6. Record levels of literacy and numeracy in schools. 7. Young people achieving some of the best ever results at 14, 16, and 18. 8. Funding for every pupil in England has doubled. 9. Employment is at its highest level ever. 10. 3,700 rebuilt and significantly refurbished schools; including new and improved classrooms, laboratories and kitchens. 13. Brought back matrons to hospital wards. 14. Devolved power to the Scottish Parliament. 15. Devolved power to the Welsh Assembly. 16. Dads now get paternity leave of 2 weeks for the first time. 17. NHS Direct offering free convenient patient advice. 18. Gift aid was worth £828 million to charities last year. 19. Restored city-wide government to London. 20. Record number of students in higher education. 21. Child benefit up 26 per cent since 1997. 22. Delivered 2,200 Sure Start Children’s Centres. 23. Introduced the Equality and Human Rights Commission. 24. £200 winter fuel payment to pensioners & up to £300 for over-80s. 25. On course to exceed our Kyoto target for reducing greenhouse gas emissions. 26. Restored devolved government to Northern Ireland. 27. Over 36,000 more teachers in England and 274,000 more support staff and teaching assistants. 28. All full time workers now have a right to 24 days paid holiday. 29. A million pensioners lifted out of poverty. 30. The Child Poverty Act – 600,000 children lifted out of relative poverty. 31. Introduced child tax credit giving more money to parents. 32. Scrapped Section 28 and introduced Civil Partnerships. 33. Brought over 1 million social homes up to standard. 34. Inpatient waiting lists down by over half a million since 1997: the shortest waiting times since NHS records began. 36. Cleanest rivers, beaches, drinking water and air since before the industrial revolution. 37. Free TV licences for over-75s. 38. Banned fur farming and the testing of cosmetics on animals. 39. Free breast cancer screening for all women aged between 50-70. 40. Free off peak local bus travel for over-60s and disabled people. 41. New Deal – helped over 1.8 million people into work. 42. Over 3 million child trust funds started. 43. Free eye test for over 60s. 44. More than doubled the number of apprenticeships. 45. Free entry to national museums and galleries. 46. Overseas aid budget more than doubled. 47. Heart disease deaths down by 150,000 and cancer deaths down by 50,000. 48. Cut long-term youth unemployment by 75 per cent. 49. Free nursery places for every three and four-year-olds. 50. Free fruit for most four to six-year-olds at school. 52. Good Friday Agreement in Northern Ireland. 53. Walk-in Health Centres and GP out of hours Service. 54. Digital hearing aids, through the NHS. 55. Children’s Act 2004, 2008 – Every Child Matters. 56. Introduced Smoke–Free legislation, 2007 – child health improving continually since. 58. Introduced legislation to make company ‘blacklisting’ unlawful. 60. Established the Disability Rights Commission in 1999. 61. The Human Rights Act. 62. Signed the European Social Chapter. 63. Launched £1.5 billion Housing Pledge of new affordable housing. 64. The Autism Act 2009. 65. New Deal for Communities Regeneration Programme. 66. All prescriptions free for people being treated for cancer or the effects of cancer. 67. Introduced vaccination to be offered to teenage girls to protect against cervical cancer. 69. 2009 Marine and Coastal Access Act. 70. Increased Britain’s offshore wind capacity than any country in the world, to provide enough electricity to power 2 million homes. 71. Led the campaign to win the 2012 Olympics for London. 72. Introduced the first ever British Armed Forces and Veterans Day to honour past and present achievements of our armed forces. 73. Created a new right of pedestrian access, so that every family has equal opportunity to access the national coastline. 74. Led the campaign to agree a new international convention banning all cluster munitions. 75. Launched the Swimming Challenge Fund to support free swimming for over 60s and under 16s. 76. Sustainable Communities Act – created community safety partnerships. 77. Set up a dedicated Department for International Development. 78. Cancelled approximately 100 per cent of debt for the world’s poorest countries. 79. Helped lift 3 million people out of poverty each year, globally. 80. Helped to get 40 million more children into school, globally. 81. Worked to ensure polio is on the verge of being eradicated, globally. 82. Ensured 3 million people are now able to access life-preserving drugs for HIV and AIDS. 83. Improved water/sanitation services for over 1.5 million people. 84. Launched a Governance and Transparency Fund to improve governance and increase accountability in poor countries. 85. The Neighbourhood Renewal programme – introduced funding for neighbourhood improvements. 86. The Extending Schools Program – included Breakfast and Homework clubs to improved levels of educational achievement and the longer term life chances of disadvantaged children. 87. Launched the Connexions Service – provided valuable careers advice and support to young people seeking employment. 88. Introduced Working Family Tax credits to support low paid parents in work and to pay for childcare. 90. Established The Future Jobs Fund to provide all young people access to a job, training or education. 91. Introduced Warm Front – helped 2.3 million vulnerable households, those in fuel poverty, with energy efficiency improvements. 93. Introduced the right to request flexible working. 94. Introduced improved work hours – introduced a law so employers cannot force employees to work more than 48 hours a week. 95. Protection against unfair dismissal – introduced protections for workers and increased the maximum compensation from £12,000 to around £63,000. 96. Introduced Rights for Part-time workers – the right to equal pay rates, pension rights, pro-rata holidays and sick pay. 98. Introduced the Right to representation – every worker can be a member of a trade union and be represented in grievance and disciplinary hearings. 99. Rights for parents and carers – introduced the right to time off to deal with unexpected problems for their dependants, such as illness. 100. Introduced literacy and numeracy hours in schools and extended diversity to the curriculum. 101. Reduced class sizes to 30 for 5-7 year old children. 102. Introduced a public interest test, allowing governments to block international business takeovers on three specific grounds: media plurality, national security or financial stability. 104. Established the Standards Board for England under Labour’s Local Government Act 2000 for promoting and ensuring high ethical standards and code of conduct in local government. 105. Introduced the first ever Climate Change Act 2008. Thanks to Rory Doona for this excellent graphic. 1- 50 were originally listed in the Telegraph. 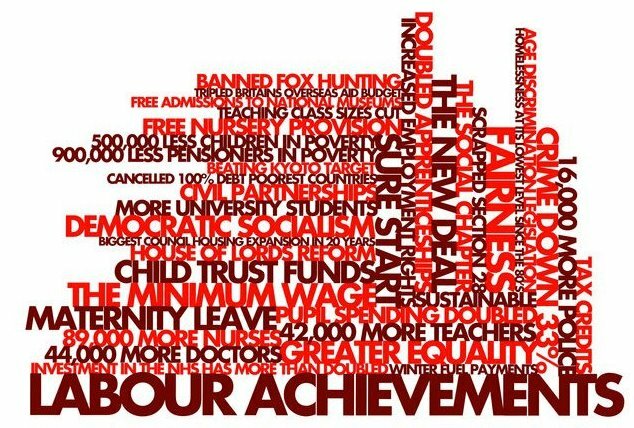 However, I recognised that some of Labour’s best achievements were not included, so I gathered the rest together over couple of years for this compilation. Many thanks to Robert Livingstone for his valuable additions and for his brilliant pictures.